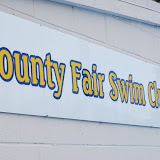 County Fair Swim Club – Waves of fun since 1961! Waves of fun since 1961! All out of Girl Scout Cookies? Is that sweet tooth nagging at you? Never fear, County Fair Swim Club is here! We are hosting our annual cookie fundraiser through Eileen’s Colossal Cookies! Don’t miss out on these deliciously scrumptious cookies! You can place your order online here: COOKIES! Last day to order is April 3rd and the cookies should be ready by April 17th. Missi’s house sits directly across the street from the County Fair Swim Club swimming pool. During the summer months, Missi makes her way to the pool every single day to check on the kids, pool, and volunteers. The most memorable moments I have of Missi are when the kids flock to her once she arrives. Sometimes she doesn’t even make it in the pool area before the kids are lined up to give her a hug. The kids love her. I met Missi Pfeifer ten years ago but was not involved with the pool until 2009. I volunteered and would help spray the deck, work on flyers, or perform any other duties as assigned. Over the course of the 2009 summer I learned just how special the County Fair Swim Club really is. During the last four years my friendship with Missi has grown into something special. She would give you the shirt off her back if you needed it. She would do the same for any of the kids who frequent the County Fair Swim Club. I have watched Missi run the pool for four years and her job is never easy. From arranging fundraising events and volunteers to prepping the pool for the upcoming season. 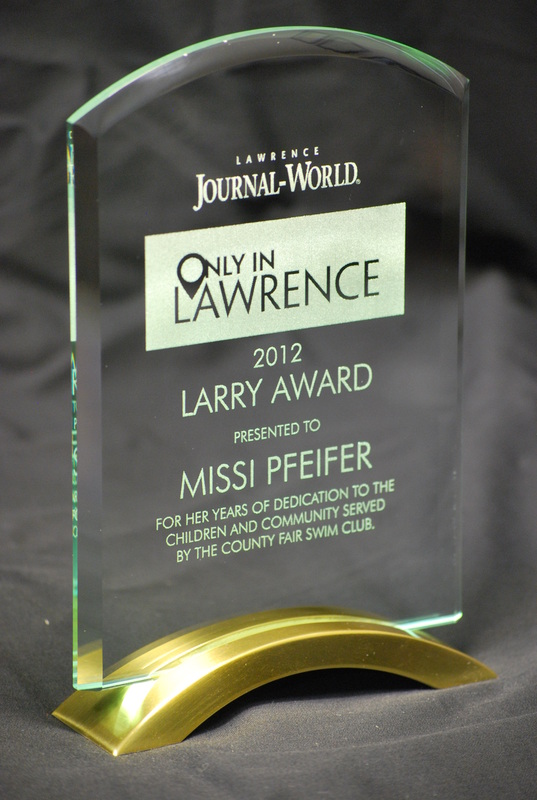 Missi works very hard to make the County Fair Swim Club a welcoming and friendly environment for the east Lawrence families and children. Missi, you deserve the award ten times over. Your hard work and dedication to the pool is something you can take with you for the rest of your life. You have touched so many lives, including my own. It’s not just the children who love you, it’s the parents, volunteers, and community who love you too. Congratulations on your well-deserved award. The County Fair Swim Club will be hosting a Halloween fundraiser for kids! We will provide a safe, fun, and active environment for an evening so our kids can play games, dance, and socialize with other children. What: Halloween Fundraiser for Kids! You may Contact Us with questions about the event. Come join us for an afternoon of poker! All proceeds will be used to pay for costs associated with opening the County Fair Swim Club for it’s 50th season! WHY: Fundraiser to raise money for opening costs. To pre-order tickets to the event, please click “Add to Cart” below. Once your donation has been made, you will receive two email confirmations. One email confirmation from Paypal, the other confirmation will include your ticket for entry. Please print a copy of the registration ticket. This ticket will be required for entry into the event. First Day of Summer – Opening Day! Hey Everyone! The time has come! Today is the first day of summer and also opening day! The kids were anxious to get in the pool today and as you can see, they are having a great time! Much time was spent on Sunday, June 06, 2010 cleaning up the pool grounds and trying to prepare for opening day. Volunteers cleaned out the employee room, painted the shelving, removed clutter, power washed chairs, tables, the pool deck, and inside of the pool. In addition, because of your helpful donations, we were able to build two new picnic tables and repair one! Thank you! We accomplished a lot on Sunday, but there is plenty more to do and we still need your help! Just a quick note to inform those who do not know (and remind those who do) that the County Fair Swim Club will be having a yard sale on June 12, 2010 to help benefit the pool. We are still accepting donations and we need your junk! Raid your basement and garages because ALL items are accepted. Anything that is not sold will be donated to the Social Service League in Lawrence. Please email us for donation locations. In addition, if you are local in Lawrence and you do not have a way to get the items to us, please email us and we can arrange a pickup of your items! Thanks again for everyone’s help and participation! The County Fair Swim Club is a 501(c) Nonprofit Organization, providing fun in the summer sun for families in Lawrence, Kansas. Your contributions to help the pool are tax deductible. This year will be our 56th season and we thank you for your continuous support! 501(c) Nonprofit. Your donations are tax deductible!